Two weeks ago, we released a Monday Map called "Growth in State Government Direct Spending". This week's follow-up Monday Map shows the changes in state tax collections per capita, and the difference is interesting – most states actually had a decrease in tax collections per capita over the same time interval as the previous map. Given that most states require a balanced budget, what's going on? Two things – first, there's been a huge increase in federal aid to state governments in the past few years, and secondly, the state spending figures in the previous map include various things that aren't paid for directly from general funds, such as social insurance payments, pensions, etc., as well as state-run utilities and liquor stores. 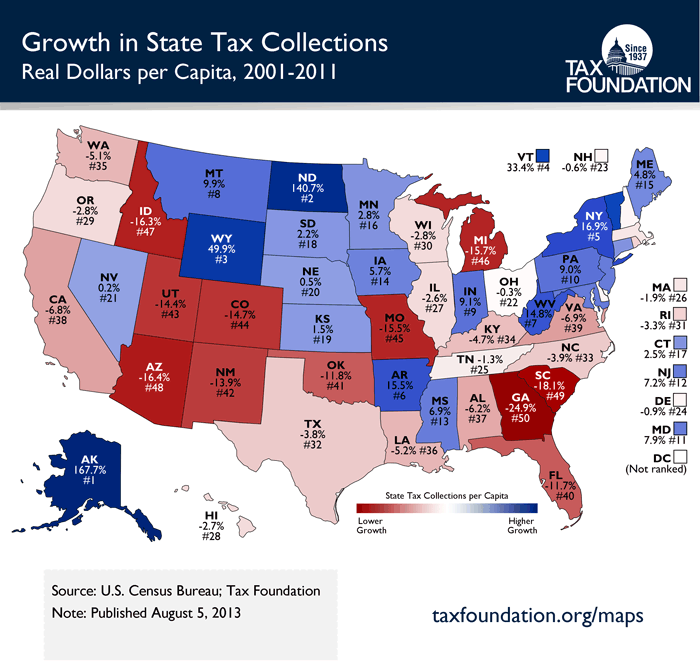 Alaska leads the pack with a 167.7% increase in state tax collections per capita, and on the other end, Georgia comes in with a 24.9% decrease.